Air Conditioning – "The Best Home Inspections"
This information and tactics applies to heating as well but the issues are much more often encountered on the cooling side. One of the issues that we often find is with Air Conditioning, usually on the Cooling side, that doesn’t perform well. In many cases the system just needs repair or maintenance. In a surprising number of cases however design or installation flaws make it impossible for the system to properly do it’s job without at least significant changes. We perform 2 basic tests on air conditioning, it’s the only way to know if the AC is actually able to cool the house sufficiently. Air conditioning technicians do not usually do these 2 tests, probably because of the amount of time it takes. Since a home inspection is going to take a few hours we have time to run the systems and wait for the results. Industry standard is that Air Conditioning should be able to cool the house down 10 degrees in 3 hours. 3 hours is a long time and unless the house was over 85 degrees inside when the test is started it will likely become uncomfortable in far less time so we abbreviate the test. We start off by noting the current temperature as shown on the Thermostat, turning on the system and setting it to cool to 56 degrees, which will insure that it keeps cooling during the entire time required. Also if anybody mistakenly adjusts the temperature during the test it will be obvious. After 20 minutes we measure the temperatures at all of the vents and at the intake. The vents should all be within a few degrees of each other or this indicates a ducting problem, typically blockage (crushed) or leaks.The difference in temperature between the vents and intake tells us if the system is basically healthy. The difference should be between 18-22 degrees. Anything more or less indicates that the machine is having trouble and needs service or repair. Comparing the temperature indicated on the thermostat now to when the test was started (20 minutes ago) tells us if the house or zone has cooled down. If it’s 1 degree or more cooler than that translates into 9 or more degrees cooling in 3 hours and the system is up to the task. If 1 degree of cooling has not been obtained or if the house is still too warm for comfort then we may proceed to a 1 hour test. In some cases units that weren’t exhibiting enough apparent cooling after 20 minutes perform well after a 1 hour test. If time and circumstances allow then we occasionally complete a 3 hour test but this is not common. One common mistake is when the Condenser (the outside part if it’s a 2 part system) is installed too close to surrounding objects/walls. Condensers must move (breath) a whole lot of air to expel the heat the system collected from inside the house. Since they are expelling heat they have to have access to huge amounts of fresh air. When they are too close to surrounding objects this restricts the incoming air more than you might imagine. We have seen several cases where removing a fence or even bushes that were too close to the condenser caused a system that had previously allowed the house to actually heat up while the system was on to being able to cool the house down very nicely. Most air conditioners require at least 1 foot clearance on 1 side and at least 3-5 feet (usually 5) on the other 3 sides. Clearance on the top varies from 5 feet to infinity, infinity working better because then the hot air is up and away. A simpler issue is when the ducting in some areas is damaged and allowing the air to escape the system or in some cases is drawing in outside air and weakening the results. In most cases the duct leaks can be found and repaired in the attic or under house areas. In others it is necessary to open up walls and or ceilings, requiring then closing up and refinishing these areas. The worst cases is probably when the ducting is inside the concrete slab. I have read about companies that can send machines inside slab ducting to line the ducting but have never actually seen a company that does it in this area. 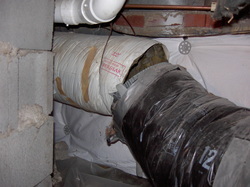 A more difficult issue is when the ducting simply doesn’t go where it is supposed to. 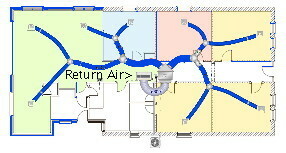 Basic Air Conditioning design requires that the ducting take the air to the exterior walls and the return system (usually via the air filter) pulls the air back through to the center of the house. With smaller rooms it can work tolerably to vent the air from the interior wall and simply direct it to the exterior wall. This doesn’t work very well when these walls are more than 10 feet or so (depending upon the location etc.) apart or if there is a large heat load on the exterior wall(s). I’m often in houses were the interior side of the room was much cooler than the exterior side due to this problem. The only cure in this case is to move the ducts to the exterior walls. Unbalanced ducting is another issue that can show up. This is where some rooms cool off nicely and others don’t. 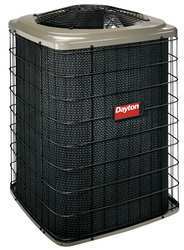 The rooms that aren’t cooling as well are simply not getting as much air flow as they need. This is a basic design flaw and may or may not be fairly easy to address depending upon how accessible the ducting is. If it’s in the attic or crawl space then it may not be that hard. If it’s in the walls, slab and or ceilings then it’s a major issue in some cases. LowesWe now have a Lowes that is closer than Hawthorne or Burbank! It’s where San Vicente crosses Pico and ends at Venice. I have long shopped at Home Depot since that’s all we had around here but a friend out of town introduced me to Lowes some time ago. I was impressed. The stores are cleaner, brighter, much better stocked and you can find people to actually help you. I’ve been to several Home Depots over the years and the stock is always messed up, I’ve spent hours there digging through bins trying to find some part that wasn’t where it belonged. I haven’t seen that at any of the Lowes. If you’re not familiar both Lowes and Home Depot have great web sites where you can not only look up what to buy but also see if it’s in stock and or order it online for store or home delivery, very handy.